E!news aired an interview last night with Valerie Bertinelli, who has just published her inspirational memoir, "Losing It: And Gaining My Life Back One Pound at a Time." Bertnielli replaced Kirstie Alley as Jenny Craig spokeswoman, and has now passed the torch to Queen Latifah. Today's healthy recipe uses chili peppers to kick this nutrient rich dish into high gear. Known as a “nutritional masterpiece,” papayas are rich in vitamin C, folate, and potassium and also aid digestion. They are also good sources of fiber, vitamin A, vitamin E, the eye-saving carotenoids lutein and zeaxanthin, and lycopene. Peanuts are a protein powerhouse and also provide 13 different vitamins (including A, the B group, C and E) along with 26 essential trace minerals, including calcium and iron. I just have to share this post and comments about mindful eating or intuitive eating from the blog Shapely Prose, which I recently learned about. It's one of the best real-life discussions of mindful eating or intuitive eating that I've seen. I don't want to take away from its thunder by excerpting it because it's really valuable to spend the time reading the whole thing, including all the comments. One note: The person who let me know about it felt compelled to say that it does contain some [email protected]# language, so I guess I should also notify you about it. Becoming a mindful eater/intuitive eater is a major step in eating well to be healthy. For some of us, it paves the way to healthy weight loss -- that is weight loss that occurs because we've gotten our bodies to higher than healthy weights because of all the unmindful/non-intuitive eating that we've done, largely the result of dieting or the diet mentality. At the very least, mindful eating can lead the way to peaceful eating, which is a huge step forward in achieving the goal of health and happiness. After you've read the post on mindful eating/intuitive eating, bookmark the blog so you can read other entries, too. It's a great place to spend some time! We at Woman’s World pride ourselves on finding inspiring diet successes to share with our readers every week. 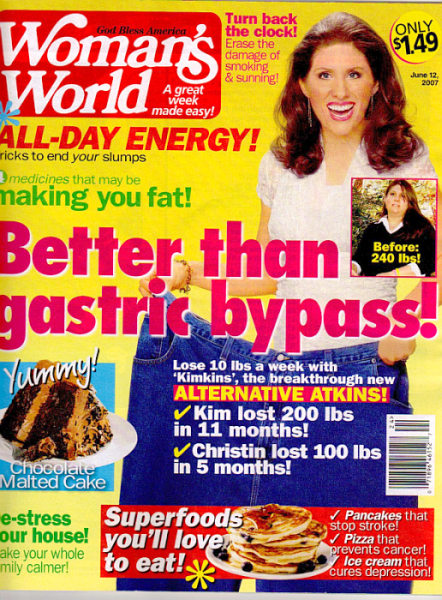 That’s why we were so distressed to learn that Kim Drake, the founder of Kimkins.com, gave us inaccurate information about herself and her weight loss. Though the article appeared several months ago, in our June 12, 2007 issue, and nutritionists assure us the diet information we provided was accurate, we deeply regret having shared with you a story we can’t stand behind. Your trust means everything to us, and we want to bring you the very best magazine we can, each and every week. Kimkins is a very low carb, very low calorie, very low fat diet plan introduced by a bulletin board commenter. Going by the nickname Kimmer, Heidi Kimberly Diaz claimed to be a modified Atkins plan that enabled her to lose weight (nearly 200 pounds) in a very short period of time. However, her website 'after' photo has been proven to be fake; she was actually using a photo from a Russian mail order bride catalog! In reality, Diaz is obese. Critics of the Kimkins weight loss diet call it an outright scam, a diet fraud that promotes eating disorders by encouraging laxative use, extremely low daily caloric intakes, and recklessly eliminating carbohydrates. There are now several blogs and websites devoted to exposing Kimkins, following the class action suit, and providing support to 'survivors' (Kimkins has even been compared to a cult). Is it too little, too late for Women's World? Some say yes. Many women and teenagers may have fallen victim to this dangerous diet scam (dubbed 'Kimorexia'), in part due to favorable publicity of the magazine. Complaints against the Kimkins diet plan can be filed the FTC at http://www.ftc.gov/ftc/cmplanding.shtm. For more information on the Kimkins scam, exposure, and class action suit, go to the Kimkins Exposed blog. In a new study published in the February issue of in the American Journal of Preventive Medicine, researchers found that the availability of more "fast food" restaurants compared to "full service" restaurants can contribute to higher levels of obesity. 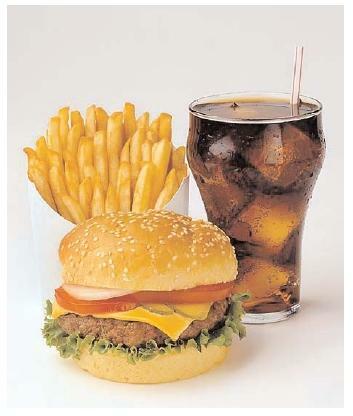 "Individuals residing in areas with a high density of total and full-service restaurants exhibit lower weight status, possibly indicating that these areas possess a more advantageous, [relatively healthy eating] environment...Those who reside in areas possessing a higher relative number of fast-food to full-service restaurants have a higher weight status," states Neil Mehta, MSc, Population Studies Center, University of Pennsylvania and Virginia W. Chang, MD, PhD, University of Pennsylvania School of Medicine. Personally, living in a town where I can give directions based on donut shops and fast food joints, I can understand the problem. Yeah, there are healthy eating choices at some of fast food restaurants, but sometimes I just want a burger and fries (and there's nothing wrong with that!) Moderation, as this study demonstrates, is the key. If you have a lot of quick temptations around you, it may take a little more conscious effort to strike a balance. The important thing is to not to tell yourself to steer clear fast food, but just make sure you're also taking advantage of other healthy eating options when you dine out. A missing link in how the insulin system is triggered and halted has now been found, which may lead to new treatments for type 2 diabetes patients. Researchers at the Salk Institute for Biological Studies have discovered how the enzyme OGT (short for O-linked ß-N-acetylglucosamine transferase), is the last link in a chain of enzymes that are responsible for transport sugars in and out of cells. OGT apparently shuts down insulin signaling soon after the body begins to pull glucose from the blood stream, causing the sugars to be stored in fat pads on in the liver. "For the first time we have a real understanding of how the insulin signaling system is turned on and off," says Howard Hughes Medical Investigator Ronald M. Evans, Ph.D., a professor in the Salk Institute's Gene Expression Laboratory, who led the study that appears in the Feb. 21 issue of Nature. With abundant food, excessive quantities of nutrients increase these enzyme levels, resulting in a dampened insuling response and a progresion of insulin resistance. Most people with insulin resistance will eventualy have type 2 diabetes within a decade, unless they lose 5-7 percent of their body weight with healthy eating and fitness. Successful permanent weight loss can be difficult; these new findings may lead to drugs that make it easier to control blood sugar, lose weight, and help type 2 diabetes to go into remission. Evans hopes that "this [discovery] could lead to a new class of insulin-sensitizing drugs that loosen the brake and let insulin work a little bit longer." Get fancy with walnuts and asparagus, and enjoy healthy eating at the same time! These asparagus and walnut hors d’overes make a wonderful presentation and are packed with nutrients. Walnuts, which contain omega-3s, exert a number of positive effects on arteries, including decreasing inflammation and reducing levels of substances that promote clogged arteries. Eating walnuts may also reduce risk of developing diabetes, and may help people who already have type 2 diabetes improve their cholesterol levels. Not to be outdone, asparagus is a good source of potassium, fiber, thiamin, B6 and rutin, a compound which strengthens capillary walls. These may be puffs, but they're heavy weights when it comes to delicious nutrition! Preheat oven to 375 degrees F. Line a large baking sheet with parchment paper or a baking mat. Roll pastry into a 10 x 4-inch rectangle about 1/4-inch thick. Cut into six (6) 5 x 2-inch rectangles. Place rectangles on prepared baking sheet and set aside. In a medium bowl combine the ricotta, the Parmesan, the basil, the walnuts, the salt and the pepper. Mix well. Leaving a 1/2-inch boarder on each side spread 1/6 of the walnut mixture on each pastry. Place 2 - 3 asparagus spears on each dressed pastry rectangle (the thickness of the asparagus will determine how many spears are needed for each pastry.). Bake until pastry is puffed and golden and asparagus is soft, about 12 - 15 minutes. Serve immediately. In this week after Valentine's Day, the topic of loving our bodies seems appropriate. Our last FitBriefing, Loving Our Bodies for Healthy Weight Loss Success, presents a good review of just how important this attitude is, even though it's very difficult for many of us to embrace. Bingeing and isolating ourselves can represent forms of self-punishment that make us feel even more discouraged and depressed." The first step in changing thoughts and behaviors is to become aware of them. Because our habit of disliking our bodies can be so established, we don't even notice when we disparage ourselves. The attitudes of mindfulness go a long way towards helping us become aware. If you're caught up in not liking your body, read the complete FitBriefing "Loving our Bodies." It has some useful techniques for starting to change these thoughts and, ultimately, even move towards a healthier place that may find us actually liking our bodies. Positive thoughts can work just like negative ones, by taking us to the places we're thinking about! "Oh Lord, won’t you buy me a Mercedes Benz? So Lord, won’t you buy me a Mercedes Benz?" I love that song. So funny and poignant. The lyrics got me thinking today about my own body, and the fact that for the last 50 years it's been my main source of transportation. Regardless of how I've treated it, it has taken me where I wanted to go. Even if I haven't always kept it tuned up or in good shape along the way, it plugged along, spitting and sputtering only on the rarest occasion. Every now and then letting out a loud 'k-bang', just to be heard, but reliable and trustworthy just the same. What a magnificent machine. I took the analogy one step further and began to wonder, what kind of ride am I? Today, in this moment. A Benz, an old Studebaker or a 1967 Pinto? What I realized was, regardless of what I am today, I'd rather travel down the road of life in a Mercedes Benz than a broken down Chevy! (A 'classic' Mercedes Benz to be exact). The greater message is not about who has the best looking chassis, but what kind of ride do you get? I don't necessarily need to be a Porsche (maybe that's for you! ), but if given the choice, I'd sure choose a high performance, sleek, comfortable, yet quiet ride, with plenty of agility on the road to get me where I've got to go - especially considering I'm not getting any younger. Well, until I'm being chauffeured around, that is. Then it's Lincoln - all the way! Tags: mercedes benz , fitness , healthy lifestyles , perfectionism . Results of an analysis of multiple studies show type 2 diabetes and diabetes control is more challenging for Hispanics than non-Hispanic whites, according to researchers at Wake Forest University Baptist Medical Center and colleagues. The results revealed that Hispanic patients with type 2 diabetes have approximately 0.5 percent higher levels on a test that measures blood sugar control, called the A1C test, than non-Hispanic white patients. The researchers noted the consistency of these findings across the studies. An A1C test measures hemoglobin linked with glucose, or blood sugar, over a time period of two to three months. Higher A1C values indicate type 2 diabetes patients have difficulty controlling their blood sugar. The results of the "meta-analysis" are reported in the February issue of Diabetes Care. "A high percentage of Hispanics in this country have low incomes, no health insurance, and limited access to health care," said Kirk. "The Hispanic population has a high prevalence of [type 2 diabetes] and higher A1C than non-Hispanic whites. This further elucidates the health disparities that characterize the Hispanic population." Read full article in Medical News Today. More information for Hispanics with diabetes may want to read "Prevengamos la diabetes tipo 2. Paso a Paso" ("Let's prevent type 2 diabetes. Step by Step") - a campaign from the National Diabetes Education Program.